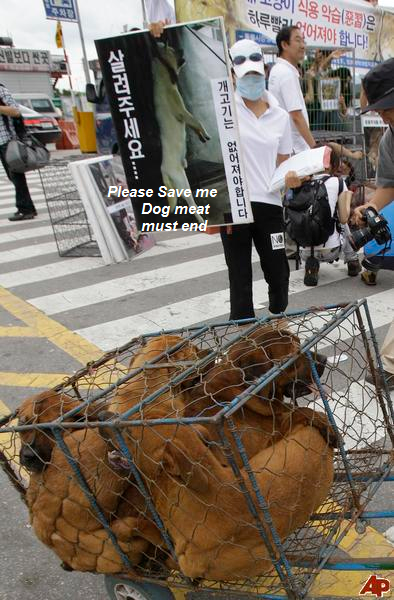 Home / What You Can Do / More Contacts For Protest / Write to UN and World Organization for Animal Health (OIE) – Urge S. Korea to Ban Inhumane Dog & Cat Meat Trade! South Korea is the World’s 14th largest economy yet an estimated 2.5 million dogs and thousands of cats are slaughtered and eaten as “health food” each year. International organizations supposed to set standards for animal welfare and food safety consistently and shamefully have refused to acknowledge this issue turning a blind eye on the unimaginable suffering of these animals. Let’s email & ask them to stop ignoring this horrendous brutality to helpless animals and urge S. Korea to ban this immediately! In addition to the unspeakable cruelty perpetrated dog meat trade is also a serious threat to human health and environment. Dog farms are hotbed for infectious diseases. Since there is no disease control these dogs suffer from diseases from highly infectious and transmittable bacteria, virus, ectoparasites, endoparasites, and fungi. Out of 165 dogs bred at a dog farm in Seoul area, 83 dogs(50.3%) were infected with endoparasites and 23 dogs(20.2%) were infected with heartworm. There is no appropriate animal-protection legislation to prevent the animal cruelty currently taking place in S. Korea. As someone who believes strongly that animals should not be treated in this way, I request that your organization investigate and address this issue immediately. Please sanction S. Korean government until they strengthen the Animal Protection Law to prevent animal cruelty and to introduce basic animal-protection regulations. It must also provide penalties for violations and ensure that mistreated animals can be legally seized from abusers and given immediate refuge. I request that the United Nations strongly urge S. Korean Government to create an enforceable law to ban the torture, killing, sale, and consumption of dogs and cats. Please don’t let the S. Korean government get away with this outrageous cruelty to companion animals. There is no appropriate animal-protection legislation to prevent the animal cruelty currently taking place in S. Korea. As someone who believes strongly that animals should not be treated in this way, I request to you, Delegation of the European Union to the Republic of Korea, to investigate and address this issue immediately. Please urge S. Korean Government to strengthen the Animal Protection Law to prevent animal cruelty and to introduce basic animal-protection regulations. It must also provide penalties for violations and ensure that mistreated animals can be legally seized from abusers and given immediate refuge. I request that Delegation of the European Union to the Republic of Korea strongly urge S. Korean Government to create an enforceable law to ban the torture, killing, sale, and consumption of dogs and cats.